The iOS lets you to either enable or disable the Slide to Unlock feature in your iPhone or iPad. We take you through the procedural process of enabling the feature in your iPad or iPhone. iOS 10 is a stand out operating system that has been a contentment to beta testers. It features a good chunk of deliberately amazing features. It is worth installing in your iPhone considering lots of features at your disposal. With lots of praises which I was a victim of liking, I was displeased with the abrupt removal of the Slide to Unlock feature. We unveil the trick to regain it back! It worked well in the iOS 10 beta 1 but then things changed. It barely goes through nowadays. However, here, you will discover how you can definitely turn tables and disable the “Press home to Unlock” feature. Well we have disclosed this trick to those who do not appreciate the Press home to unlock feature. It is all explained in our sequential procedure of enabling the Slide to Unlock feature on iOS 10. 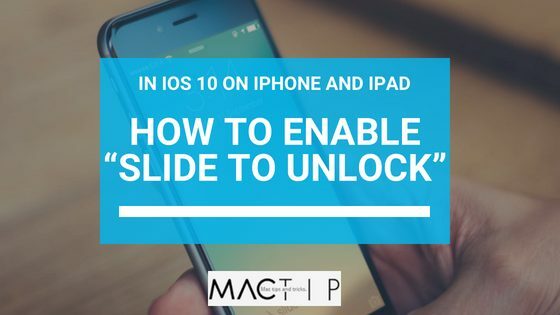 Steps to enable the Slide to Unlock feature on iOS 10 in iPads and iPhones. The first step is to create a backup of your iPad or iPhone via iTunes. Ensure the backup is unencrypted. The process can be succeeded both on Mac and Windows. You need to download the iBackupBot then install it in the computer. When already installed, you can now launch the iBackupBot. Select your backup in the iBackupBot. Follow the path below to open the Preferences. The sidebar would be of great help in leading you to the path. Afterwards you would click twice on the preference. This should open com.apple.springboard.plist. Now save the changes by saving the file. You are almost done! You will now need to close the iBackupBot app. Restore your backed-up information from your iTunes account. IPhone or iPad will restart when every processed is successful and complete. You are all set to go! The slide to unlock will be displayed on your lock screen. To wrap it, the slide to unlock feature was appreciated by iPhone and iPad users. Removing it made the group of liking followers to look for an option. Due to the persistence, we have gone out of our ways to utilize our expertise and give you this trick which might be of great help to iOS 10 users. Find out the step by step direction in our guide on enabling the Slide to Unlock bar on the lock screen.